Anthony Kiedis has arrived to the ends of the Earth. 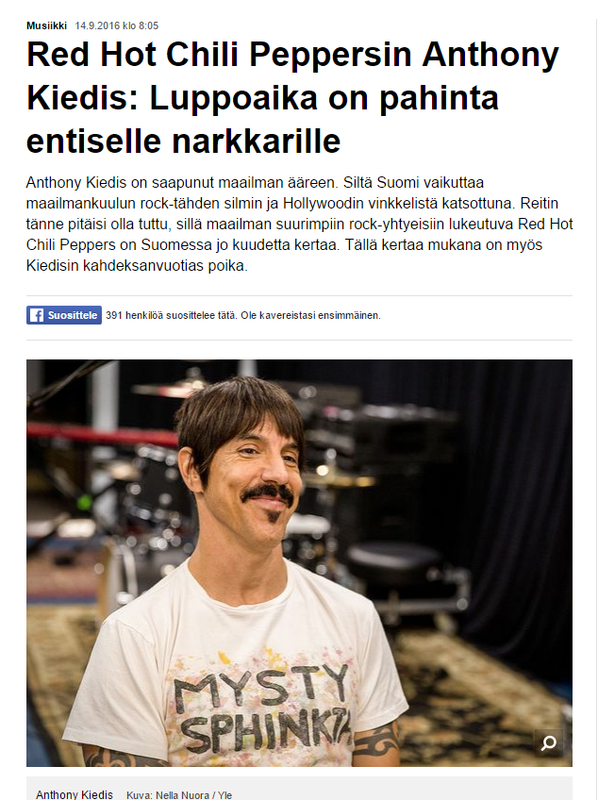 That’s how Finland seems in the eyes of the world-famous rock star and Hollywood. The route here should be familiar, because this is the sixth time in Finland for one of the biggest rock bands in the Earth, Red Hot Chili Peppers. This time Kiedis’s eight-year-old son is with them. It’s been almost 30 years since the first visit. The televised gig at Provinssirock drew attention not only with its energy but also because the only thing the band wore were tennis socks to cover the strategic parts. – We were young, healthy boys from Hollywood. Maybe we were looking for the sexual vibes in our performance that are in our music. We did “sox on cox”-performance in special occasions, and the gig in Provinssirock was obviously one of them. The death of one of the founding members of the band, the guitarist Hillel Slovak, cast a dark cloud over the first gig in Finland. He died of drug overdose not long after the tour. -When we came back home to Los Angeles, Hillel was thinking about his future: Should I change my habits or should I stay the safe, dangerous road. We didn’t understand how deadly some drugs can be. In some cases trying once is enough. – I still miss him. On the other hand the tour had gone well and it left a beautiful memory of him. Anthony Kiedis has a long history with drugs as well. He has been sober for years, but the drug background still affects his life. – It is definitely a part of my psyche. I have been sober for a long time, but drugs are still a part of me. The are numerous stories of the rambunctious tour-life of the rock bands. Maybe to somebody’s surprise Anthony Kiedis thinks months-long tour is a safe environment. – On tour I am at work. Focused. I have things to do. It’s harder after the tour, when you go home. Then I am isolated. And what’s even worse, I have free time. Then you have to be careful. One motivation to making an effort is the fact that Kiedis is a father to an eight-year-old son. He is with him in Helsinki. – I want him with us on tours. Of course sometimes he is at home and goes to school. But it is fun that we can do stuff together during long tours. I thought of showing him a bit of Helsinki, maybe we’ll make a short walk to the parks. It is important that he gets at least little influences from rest of the world. Red hot Chili Peppers is one of the most popular bands in the world. The band has sold tens of millions of albums. A key influencer on the background has been Rick Rubin, the producer wizard, for over two decades. When Red Hot Chili Peppers started working on their latest album, they let him go, though. – Maybe that’s just that, we had worked with him for so long. We had to challenge ourselves, to step out of our comfort zone. To do something, that forces us to change. The producer on The Getaway -album which was released during the summer is Danger Mouse, who is better known in the electro music genre. He has worked with Beck and The Black Keys, who are heavily influenced by traditional rock’n’roll. Anthony Kiedis says Danger Mouse is nice, but firm guy. – The way Danger Mouse works is completely unique. His creative work happens in the studio. It’s very spontaneous. Sometimes we would go to the studio in the morning with nothing, and at midnight when we went home, we’d have a finished song. – He would tell our bassist Flea to play like James Brown. Or change it to something else if he didn’t like what he heard. He was actively involved in the song writing process. Red Hot Chili Peppers is not know as very political band. 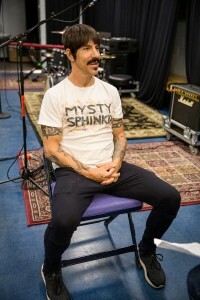 Anthony Kiedis, who is in charge of lyrics, admits that the band has no political agenda. Despite of that he perks up when we start talking about the presidential campaign of USA. – We were with democratic candidate Bernie Sanders. He was an exceptional candidate: Trustworthy, smart, empathetic. -Last 130 years, ever since industrialism, the presidents of United States have been puppets of billionaires like Rockefeller. They have decided who will be the next president with their dollars. Bernie couldn’t be bought. Kiedis’s favourite didn’t reach the final round. Two bad candidates were left. – I have to pick one of two poisons. Maybe I will choose slower death aka Hillary. She just got sick though, which can have a surprising impact in the result. What is important is how fast she can recover and if she can give a strong impression on TV debates. Kiedis thinks Republican candidate Donald Trump is a reality TV star who is not measured on the same scale with other politicians. – We look at him like he’s an entertainer. If Trump lies or says something outrageous, we think, that that’s just the actor he is. In the United States publicity is everything. That’s why musician who have searched stardom are a part of the political game. Anthony Kiedis doesn’t feel pressured to state his political opinion, though. – I don’t think about fame. I just want to tell the truth. Also, I am not politically active artist. I make music because I want to create something beautiful and positive into this world. In the end, politics are quite depressing. Many thanks to Linda for the translation!